On July 6, twelve students began their journey to Lake Wales, Florida, for the start of A.One.8 2017. The students came from nine different states from across the country. For some, it was their first-ever flight, beginning a journey of firsts. A.One.8 is a three-week discipleship training designed to connect late high school and early college students with cross-cultural learning and ministry engagement. The name comes from Acts 1:8, “But you will receive power when the Holy Spirit comes on you; and you will be my witnesses in Jerusalem, and in all Judea and Samaria, and to the ends of the earth” (NIV). Students spent the first two weeks in Lake Wales, Florida, doing training at h.e.a.r.t. and Warner University, as well as serving and learning about local ministry through the work of the Lake Wales Care Center. The final week together was spent in the Dominican Republic learning from Church of God leaders and serving alongside youth from a local congregation. The educational side of A.One.8 is done in both tradition learning and practical ministry involvement. 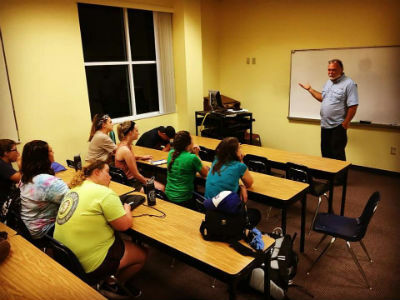 In the classroom setting, students learned about biblical foundations for missions, cultural anthropology, their personality and leadership, the global church, and just a little Spanish. But they also heard stories from various people in ministry, including pastors, campus ministers, professors, missionaries, and social service providers. Phil Murphy (h.e.a.r.t.) teaching A.One.8 students. 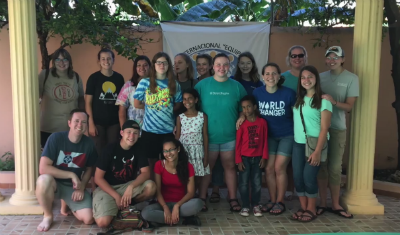 In the Dominican Republic, we were joined by eight youth from a local congregation. The church, under the supervision of Pastor Juan Santos Lugo and Radaisis Esteves, took care of us throughout our entire stay in the DR. We visited congregations, joined in worship, met Children of Promise-sponsored kids, and learned about the culture and history of the DR. Though the goal was to see students grow and learn, one of the aspects of the experience that most students remarked on after was the community that was formed. We saw community in many ways throughout the trip. Our first weekend was spent together on a canoe trip down the Peace River. One canoe tipped over when the paddlers didn’t see a large tree limb sticking out of the water. The river swallowed up several belongings and what was left was soaked. When we arrived at our campsite for the night, those from the tipped-over canoe shared about the things that were lost or wet. Incredibly, different people in our team had packed extra things for the journey, many of the things they lost—clothes, sandals, bedding, even a journal! God provided through a sharing community. We also experienced community in the DR. One night, on our way to a church service, our bus got stuck on a hill. We weren’t going anywhere. But within minutes, people from the neighborhood emerged. They hollered at others to bring needed tools. They drove vehicles to pull the bus. They devised plans to get us moving again. At least fifteen people helped, many of whom stayed for the entire forty-five minutes it took us to get the bus moving again. We were amazed and thankful for the generous assistance this community provided to us, people they didn’t even know! A.One.8. 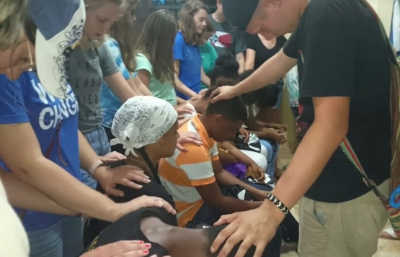 students praying over local students in the DR.
One student wrote in a Facebook post, “I experienced the type of community my heart longed for.” Another student, Lizzie Butler, wrote a blog for the Global Strategy website after the first two weeks together in Florida. In part of the reflection, written while at h.e.a.r.t, she shares how the challenges the team faced brought them into closer community with one another. For more information, visit www.chogglobal.org/a.one.8 or find A.One.8 on Facebook and Instagram. This entry was posted in All Church of God, Global Strategy, Leadership Development, Youth Ministries and tagged A.One.8, Andrew Gale, AOne8, Children of Promise, CHOGY, Domincan Republic, DR, FL, Florida, h.e.a.r.t., heart, Lake Wales, Lake Wales Care Center, leadership development, missions, students, travel, Warner University, youth. Bookmark the permalink.